Captain Mark Shepard born in Hamilton, Ohio lived on family farm in Fairfeld, Ohio tell the age of 9. We had a farm pond, where my brother and I loved to fish more than anything else. We fished every pond and creek we could find, my grand father fished with us all the time. We went to Florida every year for vacation, we hope to sell the farm some day and buy a place in Ft. Peirce, Florida. We eventuality sold the farm, my family moved to Ft Pierce and the family bought a small fishing resort on South Hutchinson Island in 1975. I grew up around fishing both tourist and commercial fishing industry, living in Ft Pierce I had the best salt water fishing at my finger tips. But, as you can probably imagine I loved bass fishing the best, as kid I love going to Lake Okeechobee the best! I had small boats as a kid, but when I got about 16 years old I purchase my first bass boat. I bass fished all over South Florida until the age of 26, when I went up North with my boat in tow learning to fish Northern lakes and rivers. This helped my professional fishing career a lot, I then went on to start fishing with FLW Outdoors in 1996. 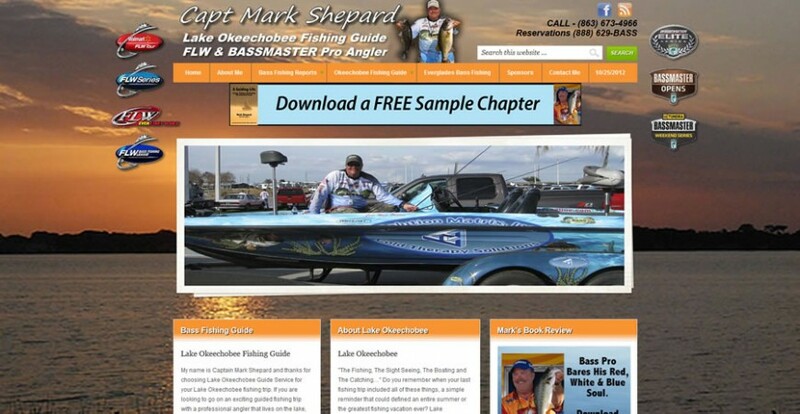 Captain Mark Shepard has become a skillful professional angler, sensational fishing guide, promoter and top competitor on the BASS Master & FLW Outdoors tournament trails. In addition, Mark is the creator of his very own hand carved crank baits.